The recent signing by Chile of several international trade agreements—a free trade agreement (FTA) with the United States and agreements with the European Union, the European Free Trade Association (EFTA) and Korea—as well as the launch of negotiations with Singapore and New Zealand, have definitely placed Chile at the vanguard of trade integration. The wide scope of the agreements and the importance of the partners suggests that Chilean trade policymaking has reached a high-water mark, pursuing a trade policy strategy that began to be implemented at the turn of the 1990s. • Unilateral liberalization and development of the internal market. • Active multilateral and regional participation (World Trade Organization, Free Trade Area of the Americas, Asia Pacific Economic Forum, etc.). • Wide and aggressive bilateral negotiations. In the mid-1970s, the economic authorities of the Chilean Military Government rejected the logic of import substitution industrialization (ISI). Their view was that the internal market would grow sufficiently for efficient performance and to allow productive sector specialization. 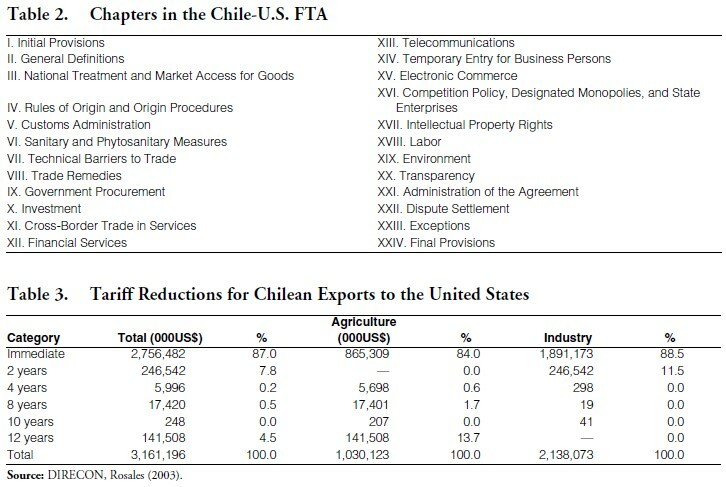 At that time (1973), the average Chilean tariff was about 100%. There were also large variations in tariff levels across commodities, reflecting the logic of offering each sector the level of protection that would guarantee their income- yield capacity. Internationally isolated after the military coup and surrounded by a state of general autarky in the region resulting from the general application of ISI, the bilateral option was impossible. Thus if Chile lowered its tariffs, it would do it for efficiency gains, but “in exchange for nothing” with respect to the protection tariff structures of other countries. More than an integration policy, Chile’s elimination of tariffs was a microeconomic reform that eliminated internal distortions caused by protectionism. When the democratic government took over in 1990, Chile’s customs tariff was 15% for all goods. The process of opening to international competition had hit several economic sectors hard, but shifting demand for local products for demand for imports made feasible the reallocation of resources toward the exporting sector. Exports had grown at rates exceeding 10% a year, reaching in 1990 a volume five times larger than in 1975. Convinced of the soundness of the unilateral strategy, the democratic government decided to expand it and, in 1991, lowered the general tariff from 15% to 11%. Around that time, the first opportunities for bilateral agreements surfaced, as the international community was getting ready for the Uruguay Round of the General Agreement on Tariffs and Trade (GATT), which gave rise to the present World Trade Organization (WTO). The key role of the WTO in the liberalization of world trade is not at issue: world trade liberalization can only be obtained by means of multilateral agreements. The greatest success of the WTO to date has been to develop a series of basic rules to regulate world trade and a mechanism to resolve disputes. These rules are the result of many international negotiations, culminating with the Uruguay Round Agreements in 1994. The strength of the rules is evident as they have been strong enough for the institution to withstand the failures in Seattle (1999) and Cancún (2003). Chile incorporates effectively the WTO as a center piece of its trade policy strategy, but not as an exclusive element. For this reason, Chile has negotiated and will continue to negotiate free trade agreements with partners ready to advance in reciprocal liberalization, within the general framework of the WTO. In this way, when world trade liberalization via the WTO occurs, Chile will have already “arrived” at its main markets. Chile was the first country to react positively to the “Initiative for the Americas”1 proposed by President George Bush, who in an official visit to Chile (1991) was talking about a bilateral free trade agreement (FTA). 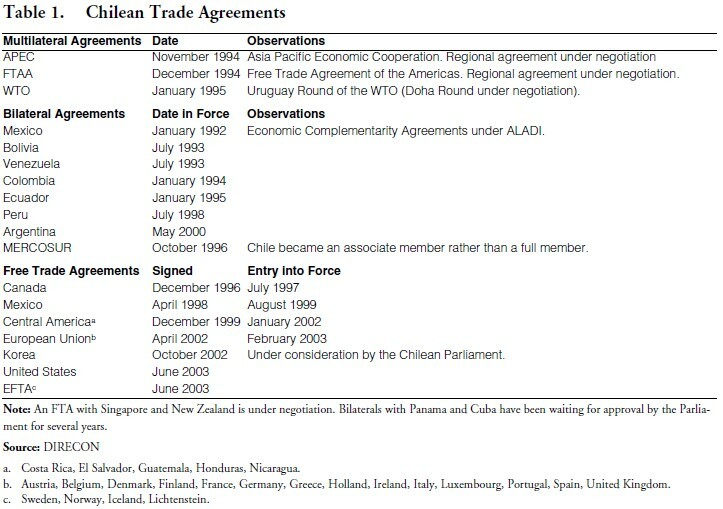 Nevertheless, more than a decade and three governments have passed before signing it, if we consider that, on the same year of Bush’s visit, the experts were starting to meet to explore the long road that culminated with the signing of a Chile-U.S. FTA in December 2002. It was under the first Clinton Presidency, when the North American Free Trade Agreement (NAFTA) between the United States, Canada and Mexico came into force, that the first step was taken to start a liberalizing agenda designed to make a free trade area within the 34 democratic countries of the hemisphere. Soon came the First Summit of the Americas and with the launching of the negotiations toward a “Free Trade Agreement of the Americas” (FTAA), the ship of hemispheric trade integration seemed to be arriving to port. Chile’s exports are widely distributed: the United States, Europe, Asia and Latin America each represent about 20%. This composition of exports imposed the challenge of negotiating agreements with all the continents, because concentrating on a single partner would have had created enormous trade diversion. For this reason, while the United States could not negotiate because of lack of fast track authority, Chile entered into FTAs with NAFTA partners that did not impose this requirement, with Central America and all its neighbors (simpler agreements), and also associated with MERCOSUR, ALADI and APEC. Table 1 summarizes this impressive process of negotiations. A few days before the summit at Florianopolis (November 2000) at which MERCOSUR and Chile were going to discuss a common strategy to confront the United States in the FTAA, a formal announcement of the re-initiation of FTA negotiation between Chile and the U.S. was made. President Clinton had only a few months left in the White House and Lagos had only been a few months in La Moneda. The first round of talks occurred some time after the announcement, even though the real initiation of the negotiations had to wait until the new Bush administration team was in place. There were negotiations every month during the whole year 2001, even though Fast Track had not been authorized. Fast track was approved—by the closest of margins—in August 2002,5 precipitating the closing of the negotiations in December. Understanding the FTA text is not an easy task. As any law, it is constructed and dominated by legal concepts that specify details that will govern the relationship between the partners. The composition of the negotiating teams (50-60 per country) was heavily weighted in favor of lawyers and economists from different public departments within the two governments. The 24 chapters of the legal text (Table 2), some of them generic and others specific, cover 19 issues, grouped into seven general areas of negotiation: 1) Market Access; 2) Trade Remedies; 3) Customs Rules and Standards; 4) Services; 5) Investment; 6) Labor; and 7) Environmental Issues. The most significant outcome is the total elimination of protective tariffs and other restrictions on mutual trade over a twelve-year period. This longer period is only applicable to the agricultural sector, because in two years all non-agricultural trade will be free. Table 3 shows the schedule for phase out of the tariffs.6 As it was anticipated, the most important sensitivities were in the agricultural sector, where full liberalization requires a 12-year period. That the Chile-U.S. FTA is up to date with the millennium is evident in the commitments on Electronic Commerce, the first agreement in the world with a chapter that maintains cyberspace free of protective tariffs and barriers. Both countries commit not to apply protective tariffs to digitalized products, which could be sent by electronic means or that are transmitted through other means. No part of the agreement was discussed as intensely as Labor and Environmental issues. 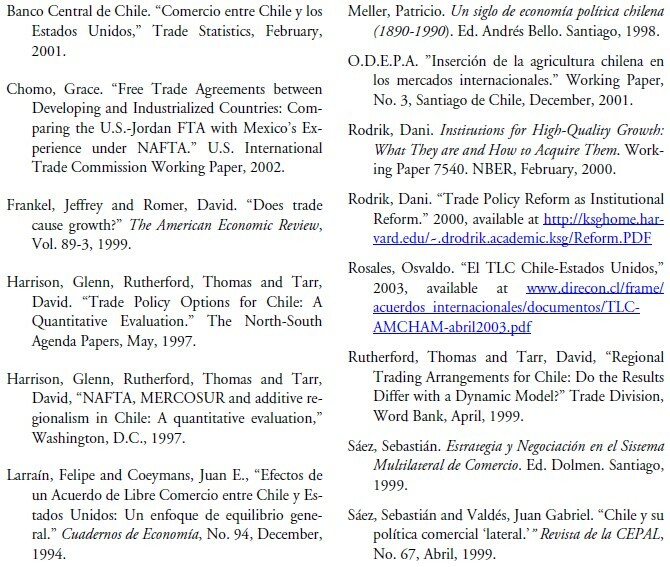 Chile did not want to negotiate them as part of the Agreement, and preferred a “parallel” solution along the lines of the agreement signed with Canada, following the NAFTA model.8 The local business community anticipated a disaster if these topics were handled within the agreement and even the Chilean-North American Chamber of Commerce was opposed to it. The final result shows the political importance of this issue in the United States. This chapter was not effectively negotiated until Congress approved TPA (which includes it as a sine qua non requirement). At the end of the day, there is a Labor chapter in the agreement, and fines (of up to US$20 million) and commercial business sanctions (as a last measure) are included. The parties maintained their right to set labor standards, consistent with international labor standards of the International Labor Organization (ILO). Both countries agreed to effectively enforce their own laws in five specific areas: freedom of association; collective bargaining; working conditions; forced labor; elimination of child labor and minimum age to work. On environment, the commitments are the same regarding effective enforcement of environmental laws, even though there are no minimum international standards. Summarizing, any “action or inaction” with respect to the application of domestic environmental laws is susceptible to a lawsuit, if it harms trade. Neither party can relax environmental laws to promote trade or attract investment. The Environmental chapter includes an annex with specific cooperation programs between both countries. The main impact of these obligations will fall on the Chilean Congress. This new factor will have to be considered before any modification in labor or environmental norms. The corresponding authorities will also need to be transformed, since they are the ones in charge of enforcing the law. Chile assumed a commitment to open widely the services market, across borders (e.g. Electronic Commerce), as a result of physical movement of the seller or the buyer (Temporary Entrance), or because of presence in the territory of the other country to provide it (Investment). There are commitments of “regulatory equality,” independent of the provider’s origin; this means the regulator can not discriminate because of nationality and must maintain the same requirements. Commitments regarding transparency were also included. Thus both countries must consult with each other before changing regulatory matters and their views must be taken into account. The assumed commitments on investment ensure the protection of foreign investments within a defined and predictable framework, with the same rights and requirements than national investments. In addition, the investor’s rights are clearly defined, avoiding frivolous demands of “dreamers” and demands against the State like the ones that destabilized NAFTA through claims of indirect expropriation. It is expected that the commitments assumed by Chile, granting greater certainty and credibility to the protection and equal treatment of investments, will attract higher levels of U.S. investment. Another particularly complex topic was resolved during the last days of the negotiations: the attributions of the Central Bank of Chile in the regulation of capital flows. The topic is important for Chile, because in order to avoid the volatility of speculative, shortterm capital flows, the Chilean monetary authority applied a reserve requirement that made more difficult the movement of such capital. The last time it was applied, between January 1996 and June 1998, the requirement was 30%, to be reduced to 10%, and then to 0%. Even though at the time of the negotiations the requirement is not applied (in other words, a reserve requirement of 0% was applied) the ability to apply such requirement is one of the attributions that the law grants to monetary authorities. The dispute became a great political and academic issue. Chile’s Finance Minister, Nicolás Eyzaguirre, former Research Director of the Central Bank, traveled to the deciding meeting in Washington. His counterpart was John Taylor, U.S. Under Secretary of the Treasury. It was a question of principle for the United States that there be no restrictions on the capital movements of its investors. Chile did not want to diminish the faculties of the Central Bank and preferred to maintain the ability of the monetary authorities through the tools already available. It took twelve years for Chile to finalize a Free Trade Agreement with the United States. But Chile did not waste time during the prolonged negotiations. Chile signed agreements with all of Europe, its Latin American neighbors, and South Korea, reaffirming its leadership as an open economy and its development policy based on export growth. Thus, it diversified its trading partners and avoided its dependency in any of them. At the same time, it grew impressively and consolidated its position as the country with the lowest investment risk in the region. With the same degree of patience, Chile will have to wait another twelve years to see the complete elimination of U.S. protective tariffs, quotas and other barriers as a result of the FTA. This long time only applies to 4.5% of bilateral trade (agricultural trade) because industrial tariffs will disappear after the second year of implementation of the agreement. The impact of the FTA on the Chilean economy is uncertain in magnitude, but no doubt positive. The elimination of U.S. tariff and other protections and the certainty of zero tariffs in the future, will add value to exports and will diversify the products basket in the short and medium term. The effect on investment can be even greater: as of right now, any U.S. company that wishes to invest in Latin America will see in Chile a much more solid and attractive partner than in any other country in the region. These achievements are outstanding. It is now in the private sector’s hands to take advantage of the opportunities the government has opened for them through the negotiation of a Chile-U.S. Free Trade Agreement. 1. The initiative was announced in 1990, just after the FTA between U.S.A. and Canada (1989). It was a development agenda which included economic, trade and political aspects, emphasizing peace, democracy and prosperity as regional objective. It was an updating of the Monroe Doctrine of “America for the Americans” in a wide political-economic sense. 2. The authorization that Clinton received during his first term resulted in the implementation of the Uruguay Round Agreements and the NAFTA. It expired in June 1994 and was only given to George W. Bush in August 2002. 5. There also was a discussion about this in Chile, because there was great concern in the Chilean agricultural sector about negotiating an agreement with a power that had just approved a very large package of agricultural subsidies. Additionally, the restrictions that the Trade Promotion Authority legislation imposed on the executive left the negotiation capacity very limited. With respect to the debate in the United States, just remember that three votes in the Senate and one in the House approved the FTA. 6. The only exception with respect to the United States is tobacco. Sugar has a special tariff mechanism in both countries. 7. Total expenditures of the U.S. Government in 1998 were US$1.49 trillion, 32% of the GDP. Federal expenditures on goods alone were US$35.5 billion and at the state level US$94.5 billion. 8. This, together with the elimination of antidumping, were the most explicit, most important objectives for the Chilean authorities, although it is not known if it was done for strategic reasons or for conviction. Antidumping is one of the defense mechanisms that the United States uses and that it can continue applying to Chile since it was not limited in the FTA, although it was limited in the U.S.- Canada FTA. 9. The regulations of the Monetary Authority refer to the formal market. Thus, an argument can be made on whether there is a substantial impediment to transfers.